Jen and I are off to Seoul in early December and will be there for eight days, just enough time by our calculations to visit 12-14 restaurants that we used to go to with some degree of regularity during our days in Korea. We do have quite a few that we want to visit, but time is limited so we will have to prioritize. 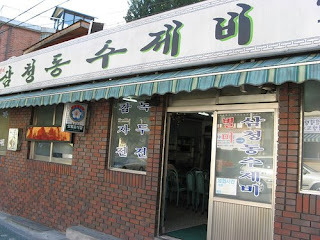 This restaurant shown above is a Sujaebi restaurant, which is basically a thick soup with something approaching dumplings inside. It is filling, hot and is perfect for the autumn/winter. This particular restaurant, to the east of Gyeonbokgung Palace in the Jongno area of Seoul, used to be frequented by former president Kim Dae Jung in his days as a student activist. It is excellent and cheap. 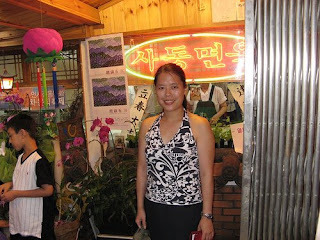 Jen is standing in front of my personal favorite restaurant for both Mandu Guk (만두국) and Dong Dong Ju (동동주). 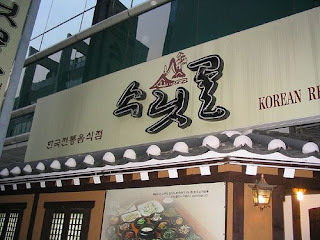 It is located in Insadong, a particularly touristy area right down the street from I used to work in Jongno. The Mandu Guk is amazing and more than enough for one person and the Dong Dong Ju is rich without being overbearing. At one point, I considered myself an amateur connosseir of the delights of this milky substance and this was always my favorite. It is down one of the alleys in Insadong so good luck trying to find it. 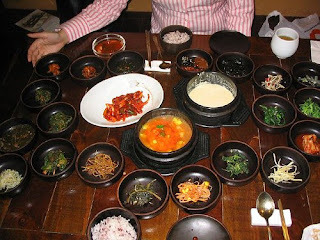 This is my one entry for Gangnam (south of the Han River) although Jen has many more restaurants she likes there. This place does Hanjeognshik exceptionally well, which is basically a table filled to the breaking point with small dishes of exquisite goodness, including roots, fish, radishes, kimchi, vegetables and anything else you can possible imagine. Absolutely fantastic. The first picture at the very top is our table spread during our last visit to this restaurant.